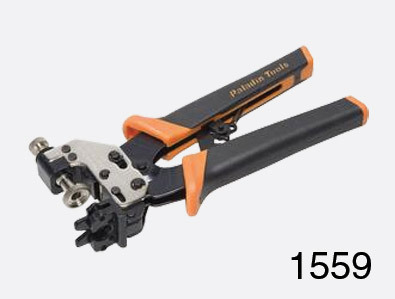 The Paladin 'SealTite Pro Crimper' crimps weatherproof and waterproof linear CATV 'F', BNC, RCA and right-angle compression-type connectors from most manufacturers for RG6, RG6 quad shield, RG59 and RG62AU cables, including common UK types CX100 and CT100. It features a fully-ratcheted system with numbered setting guide and built-in ratchet release, together with comfortable, non-slip, dual-durometer ProGrips handles. It is believed to be the only tool with a single, reversible head, eliminating the need for additional heads or plungers. The crimp height can be adjusted easily with a thumb screw and then once set properly, locked with an adjustment lock.